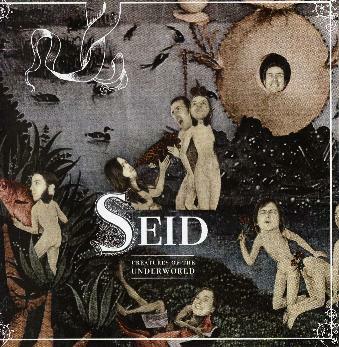 Seid - "Creatures of the Underworld"
Seid have finally released their second CD and it appears this will be the last one for some time as the band are splitting up. Perhaps not for good but at least for now. Those of you who were lucky to see their last shows this August 2006, bastards… Anyway, the band have left us with a gem of a CD that I can't stop playing. The CD opens with the cool Café Lola, one they played on the previous tour. The title track is next and is a cool dark brooding number. The band use a wide variety of instruments, not just guitar, bass, drums and keyboards (about 10 different ones!). You hear all sorts of stuff like horns, violins and strings. It is a great psychedelic soup of sound that just draws you into its cozy undercoat. Swamp Doom and the Evil Gnome are really cool tracks, a bit progressive rock, a bit psyched out stuff but both dark themed. Amazing stuff. Dragons and Demons is the longest track on the CD at nearly 9 minutes and a cool psychedelic trip. You can almost hear the dragons and demons. The sound production is very cool and psychedelic on this CD. The band completely trips you out when the Balkan like parts appear, which they also had on their previously released CD. Do as you're Told is the band heaviest hard rocking track on the CD and also one they played on their 2003 tour when I saw them. Moonprobe is a mellow and spacey instrumental piece that leads nicely into the uptempo and melodic Starla's Dream track. Flight towards the Sun ends the CD and is an amazing track with a cool guitar and keyboard line. This one really builds and has a great melodic and spacey groove. You can also check out the Meet the Spaceman video on the CD, the only official video the band produced. Maybe someday the band will release the 3 7" singles they released on a CD-EP. Great body of work they left behind and one of Norway's best and most unique bands. For more information you can visit the Seid web site at: http://www.flying.to/seid. Visit the Sulatron Records web site at: http://www.sulatron.com.